A few years ago, we had a visit from gardener and author Willi Galloway (Grow Cook Eat). She shared with us that in the unpredictable spring weather of the Pacific Northwest, the best way to approach spring planting is through noticing soil temperature. While daytime temps vary a lot this type of year, the soil temperature is much more consistent. If you look at the back of your seed envelope, it may tell you the soil germination temperature. In my experience, the soil temperature here is the average of the nighttime and daytime temperatures. If the weather warms or cools a great deal, it will take several days for the soil temperature to catch up. Today for example, the high temp is expected to be 57 degrees, and tomorrow cool to 47. So take the average of several days. So our average soil temperature for the next week is somewhere in the range of 45 degrees to 50 degrees. Right now, gardeners are itching to get out and plant, with the warming weather and less rain we are having. There are a few techniques you can use. Warm the soil by placing black plastic over a patch for a few weeks. While we all want to cut down on plastic use, you may have a few black garbage bags at home that you can reuse after they are done with warming duties. Use row cover. This is widely available at garden stores and online. It will warm your plants and soil just a few degrees, and also keep out slugs and pests. Use starts, but don’t plant too early. Free Admission. You bring the blankets and chairs, and we’ll provide the s’mores. Sara and Drew are also hosting a summer camp July 17-21. You can find out all the details at createbellevue.com. The campfire series is free, the camps are very low cost. Fun stuff! Our Seattle summers are so short, we need to seize every opportunity to celebrate our out of doors life. Orchard Gardens has published a cookbook! Thanks to Sharon and Nicole, dedicated gardeners, we have assembled a complete set of recipes from our garden clan. We have tried to incorporate recipes which include vegetables from the garden. Kale, beets, squash, and even quince have found a place in our cookbook. I can’t wait to try the “Basil and Onion Mashed Potato” recipe by Jan. The books are $10 and 100% of the proceeds go to the Backpack Meals for Kids program here in Bellevue. Backpack Meals provides a bag of food to kids who would otherwise go hungry on the weekends. You can look at their website, Backpack Meals for Kids, to get more information. Backpack Meals was started by one of our gardeners who wanted take action to help kids in Bellevue. The $10 from the sale of one book will fill a backpack for one student! A student who will surely appreciate it. You can purchase the book online at Create Space. Categories: Orchard, P-Patch | Tags: apple orchard, community gardens, cooking, garden, Holy Cross, p-patch bellevue, Vegetable gardening | Permalink. It’s the most wonderful time of the year! Merry Christmas from Holy Cross Orchard Gardens. We hope you have a wonderful holiday season. Now, on to another topic relevant to the season. What to do with the myriad of shipping boxes that have crossed your doorstep? This year, I had surgery during prime shopping season and had to be off my feet so I did a lot of online orders. I have a pile of boxes outside near my recycling bins. But I have plans for them. At Orchard Gardens, we have found that cardboard makes the most excellent weed block. There is really no downside. It’s biodegradable and pretty much free. (I’d say completely free, but I had to buy something to get the box). Flatten the box, remove any shipping tape or plastic shipping envelope. Then place in the areas where you want to suppress weeds and place wood chips, bark or compost over it. Generally, only use compost in the areas where you will be growing something. 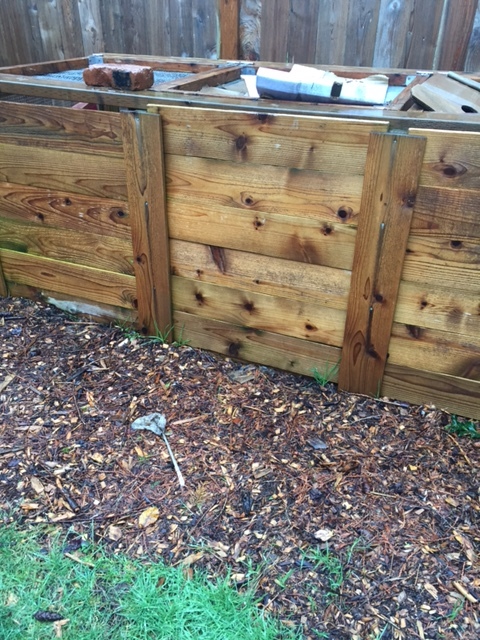 If you are suppressing weeds, a thick layer of wood chips works the best. You can buy chips in bags, or if there is a tree service truck in your neighborhood, you can ask them to dump the pile of chips in your driveway (they chip everything they put in the truck). In this photo, I placed cardboard all around my compost bins and placed wood chips on top. I also raked up cedar needles that my cedar tree sheds and put them on top. Any grass or weeds that do try to grow are easy to pluck out. Now probably in a year or two I’ll need to add more chips, but it’s pretty low maintenance. In our orchard, we are in the process of putting cardboard and chips around the base of all the apples trees. The tree will not have to compete with grass or weeds when growing and the chips will help keep the moisture in. We are partnering with City Fruit (www.cityfruit.org) to bring some substantive training to a select group of people who would like to deepen their knowledge of fruit tree care and become orchard stewards for this heirloom orchard. We are looking for a dozen people who would coordinate the monthly care of the trees with neighborhood volunteers. Can you spend 4-8 hours per month, helping to care for this lovely heirloom orchard? Our ancient orchard (50 – 75 years old) holds a number of quince trees. Before I was associated with this orchard, I had barely even heard of quince. I’ve come to know that while they are a different type of fruit, they are quite tasty. In fact, we have been selling the quince to a number of gourmet restaurants in the Puget Sound area. 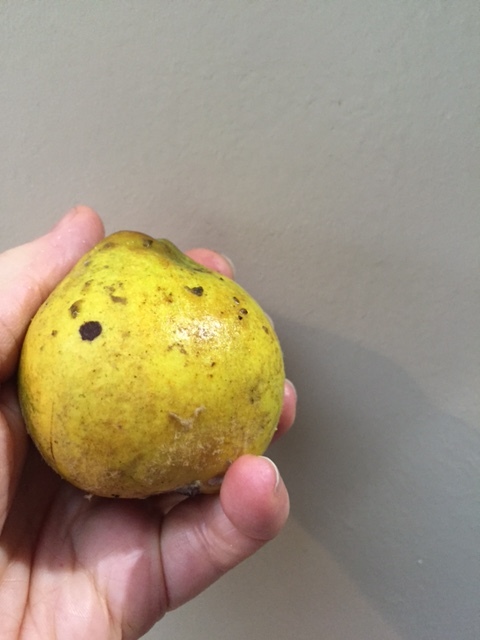 My research indicates that quince were well known with the ancient Greeks, in fact Paris awarded Aphrodite with quince in an ancient Greek myth. Quince are grown widely in Europe and were grown in the 18th Century American Colonies. One quince tree was always in the lower corner of the vegetable garden. In fact Thomas Jefferson had a quince tree in his orchard at Monticello. This was the first year I made quince jam and was pleased to discover it’s wonderful difference. 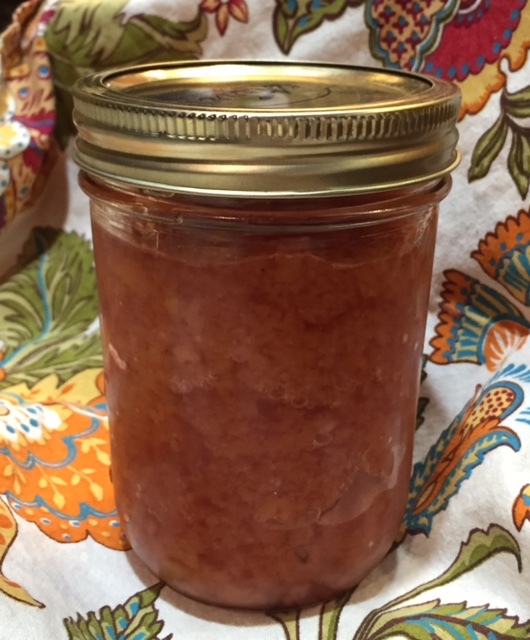 The recipe below is a jam made without pectin, so it’s more like an applesauce consistency. It’s wonderful on toast or crackers and freezes well. This recipe comes our way via Cyd, a local gardener. 1/2 lemon, seeded and coarsely chopped (including peel). Place quince and lemon in a food processor; pulse 10 times or until finely chopped. Place quince misture, sugar, water and vanilla in a large, heavy saucepan. Bring to a boil, reduce heat and simmer 55 minutes or until reduced to 3.5 cups. Cool pour into airtight containers. Refrigerate for two months or freeze in small containers.